Warning, I measured very little. This is not a recipe, but it was fantastic. May the ingredients ever be in your favor. I got the Vegetarian Flavor Bible for Christmas. I got Wild rice. I also had a bunch of old apple cider (that might have been slowly fermenting) to use up. So using both Andrea’s original and my new Vegetarian Flavor Bible I looked up what other things go with wild rice, bacon, and apple cider. It felt like a reality show challenge. Then I added dried apple, cranberries, figs, butter, maple syrup, two generous 5 finger pinch of of salt, and a lot of black pepper. (It turned out very sweet, so I added more black pepper and a bit of red pepper flakes to balance the sweetness). Added 2 cups of wild rice and 1 cup of oat groats. Let it fry for a bit, then added 8 cups apple cider. This is only because I had that much to use up. I would have happily cut that with water. When everything was cooked, I tossed it all together. It looked like my typical brown mush. It was still quite sweet so the garnishes of walnuts, green onions and a splash of white wine vinegar were critical to making it both delicious and more appealing. It made like 12 servings so 1.5lbs of pork becomes quite reasonable. It’s also enough to freeze some for some desperate and sad day. While it’s a meal in itself my favorite application was under fried eggs, or on top of salad, or both! I bet it would also be excellent on top of a waffle with a little syrup. 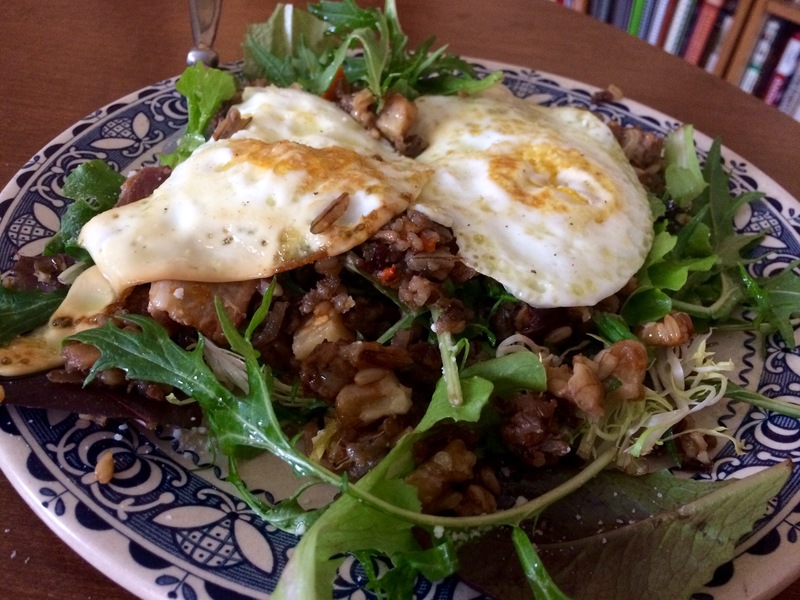 This entry was posted in Kym Cooked and tagged Flavor Bible, pilaf, sweet and savory, wild rice. Bookmark the permalink.